Atherosclerotic plaque rupture results in thrombus formation and vessel occlusion, and is the leading cause of death worldwide. There is a pressing need to identify plaque vulnerability for the treatment of carotid and coronary artery diseases. 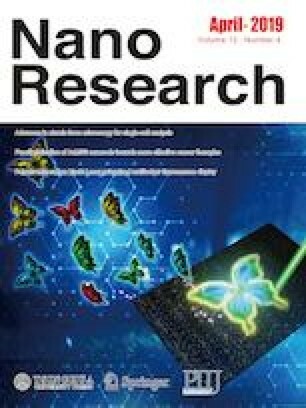 Nanomaterials with enzyme-like properties have attracted significant interest by providing biological, diagnostic and prognostic information about the diseases. 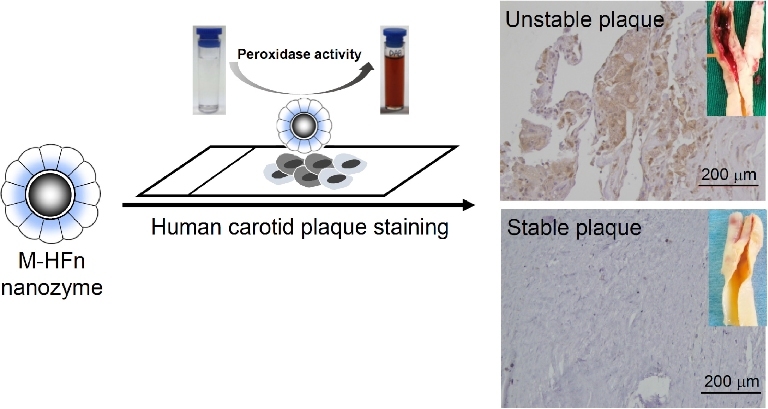 Here we showed that bioengineered magnetoferritin nanoparticles (M-HFn NPs) functionally mimic peroxidase enzyme and can intrinsically recognize plaque-infiltrated active macrophages, which drive atherosclerotic plaque progression and rupture and are significantly associated with the plaque vulnerability. The M-HFn nanozymes catalyze the oxidation of colorimetric substrates to give a color reaction that visualizes the recognized active macrophages for one-step pathological identification of plaque vulnerability. We examined 50 carotid endarterectomy specimens from patients with symptomatic carotid disease and demonstrated that the M-HFn nanozymes could distinguish active macrophage infiltration in ruptured and high-risk plaque tissues, and M-HFn staining displayed a significant correlation with plaque vulnerability (r = 0.89, P < 0.0001). Tao Wang and Jiuyang He contributed equally to this work. This work was supported by the following grants: the National Key R&D Program of China (No. 2017YFA0205501), the National Natural Science Foundation of China (Nos. 81722024 and 81571728), the Key Research of Frontier Sciences (No. QYZDY-SSW-SMC013), and Youth Innovation Promotion Association of Chinese Academy of Sciences (No. 2014078).